Light: Refusing to do something dishonest, even when there’s no chance of ever being caught. Handling a difficult situation with finesse. Pointing out assumptions. Acting ethically in public and in private. Living a life that is beyond reproach. Shadow: Stealing or lying. Doing whatever you can get away with, simply because you can. Looking for a way around consequences. Justifying wicked behavior by focusing on the wickedness of others. Failing to examine your own motives and prejudices. Story: The Main Character has an opportunity to win using dishonest means. Relationships. If you could cheat and get away with it, would you? Your answer says a lot about you…and your sense of commitment. Secrets are toxic to healthy relationships. Act with integrity, and demand integrity in those closest to you. If you’ve wronged someone, accept the consequences. Work. Embody honesty in the workplace. The smallest dishonest indulgence numbs the conscience, opening the door to larger abuses. Reign in a tendency to do as little as you can. Rather than “get by,” do your best, even if it won’t always be appreciated. Spirituality. While you must not obsess on darkness, you must confront your own Shadow from time to time. To what extent do you live up to your own highest standards? In what situations is your dedication to Spirit challenged most? To gain strength, learn from your weaknesses. Personal Growth. You may fool others, but you cannot fool yourself. When you’re alone, how do you behave? Your answer will provide meaningful insights into your true character. Fortune Telling. Don’t assume people around you are worthy of your trust. Ask for an accounting of where people have been, and what they’ve been doing. When? Between February 9th and 18th. The Sneaky Man. RWS-inspired illustrations often depict a sneaky figure, tip-toeing away with stolen goods. He carries five (the number of chaos), but leaves behind two (the number of duality). When you do something dishonest, you invite chaos into your life, and force others to question their high opinions of you. The Encampment. In the background of many RWS-inspired cards, we see a cluster of distant tents. Is the figure in the foreground an outsider, come to steal…or an insider, taking advantage of his own people? Your answer may reveal important assumptions you make without even thinking about them. Shifted Perspective. By focusing so completely on his prize, the character on this card might not foresee unexpected complications. Assumptions can blind us, keeping us from seeing critical information. What are you overlooking today? The Marseilles Image. The Sword in the center is increasingly constrained by the curved blades surrounding it. 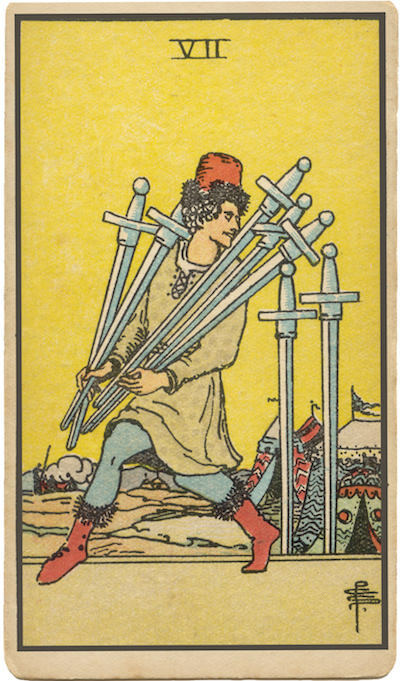 The logic of the group (the six Swords) often limits new thought (the one Sword). In what ways are your own ideas being limited by the assumptions others have taught you to make? How well-defined is my sense of ethics? How should I respond when I know others are breaking the rules?